Tundra is a geographic area where the tree growth is hindered by low temperatures and short growing seasons, and the dominant vegetation is grasses, mosses, and lichens. The term "tundra" comes from the language Kildin Sami tū̄ndra, the genitive of tundar, "treeless plain." Trees grow in some of the tundra. The ecological boundary region between the tundra and the forest is known as the tree-line or timberline. The tundra is one of the Earth's major carbon dioxide sinks, taking in more carbon dioxide than released. Contributing to this is the difficulty of decomposition of dead biomass as a result of the short, cool summers and freezing winter temperatures. Although the tundra is a harsh, generally cold climate with little precipitation and few trees, it is home to a number of species of plants and animals. And although biodiversity is relatively low, there are sometimes large numbers of particular plant and animal species. For example, in the Arctic tundra, there are herds of caribou (reindeer) that feed on the lichens and plants, and the abundant insects in summer provide food for thousands of migrating birds (Whitney 2002). But the tundra is a fragile environment where anthropogenic changes can pose risks, such as found from pollution from mining and oil drilling activities, erosion, pesticides to control insects, and construction activities. As stewards of creation, humans have an ethical responsibility toward the plants and animals that have adapted to this extreme environment. There are three types of tundra: Arctic tundra, Antarctic tundra, and Alpine tundra. Arctic tundra occurs in the far Northern Hemisphere, north of the taiga belt (biome characterized by coniferous forests). The Arctic tundra is one of the world's youngest biomes, forming ten thousand years ago from a retreating continental glacier. The word "tundra" usually refers only to the areas where the subsoil is permafrost, which contains permanently frozen water (it may also refer to the treeless plain in general, so that northern Lapland would be included). Permafrost tundra includes vast areas of northern Russia and Canada (UCMP 2006). The Arctic tundra is home to several peoples who are mostly nomadic reindeer herders, such as the Nganasan and Nenets in the permafrost area (and the Sami people in Lapland). The biodiversity of tundra is low. There are few species with large populations. Notable animals in the Arctic tundra include caribou (reindeer), musk ox, snowshoe rabbit, snowy owl, lemmings, arctic fox, wolf, and polar bears (only the extreme north) (Blue Planet Biomes 2006). The growing season for the Arctic tundra ranges from 50 to 60 days. While the winter temperatures average around -30 ºF, the summer temperatures range from 37 to 54 ºF. Scandinavian tundra tends to be a bit warmer, with winter temperatures averaging around 18 ºF. The tundra is basically like a desert, with very low precipitation, generally only six to ten inches (of mostly snow) each year (Whitney 2002). Due to the harsh climate of the Arctic tundra, regions of this kind have seen little human activity, even though they are sometimes rich in natural resources such as oil and uranium. In recent times, this has begun to change in Alaska (United States), Russia, and some other parts of the world. Global warming is a potential threat to the Arctic tundra because of the permafrost. Permafrost is essentially a frozen bog; in the summer, only its surface layer melts. The melting of the permafrost in a given area on human time scales (decades or centuries) could radically change which species would survive there (Yukon Conservation Society 2004). Another concern is that about one third of the world's soil-bound carbon is in taiga and tundra areas. When the permafrost melts, it releases carbon in the form of carbon dioxide, a greenhouse gas. The effect has been observed in Alaska. In the 1970s, the tundra was a carbon sink, but today, it is a carbon source (Oechel et al. 1993). One study has shown the potential for 77 percent or more of the tundra to be gone by the year 2100 (Oregon State University 2004). Antarctic tundra occurs on Antarctica and on several Antarctic and sub-Antarctic islands, including South Georgia and the South Sandwich Islands and the Kerguelen Islands. Antarctica is mostly too cold and dry to support vegetation, and most of the continent is covered by ice fields. However, some portions of the continent, particularly the Antarctic Peninsula, have areas of rocky soil that support tundra. Antarctic flora presently consists of around between three hundred and four hundred lichens, one hundred mosses, 25 liverworts, and seven hundred terrestrial and aquatic algae species that live on the areas of exposed rock and soil around the shore of the continent. Antarctica's two flowering plant species, the Antarctic hair grass (Deschampsia antarctica) and Antarctic pearlwort (Colobanthus quitensis), are found on the northern and western parts of the Antarctic Peninsula (British Antarctic Survey 2004a). In contrast with the Arctic tundra, the Antarctic tundra lacks a large mammal fauna, mostly due to its physical isolation from the other continents. Sea mammals and sea birds, including seals and penguins, inhabit areas near the shore, and some small mammals, like rabbits and cats, have been introduced by humans to some of the sub-Antarctic islands. The flora and fauna of Antarctica and the Antarctic Islands (south of 60º South latitude) are protected by the Antarctic Treaty (British Antarctic Survey 2004b). Alpine tundra is tundra that occurs at high altitudes at any latitude on Earth. This is usually somewhere between 11,200 and 12,000 feet depending on latitude and slope exposure. Alpine tundra also lacks trees, but does not usually have permafrost, and alpine soils are generally better drained than permafrost soils. 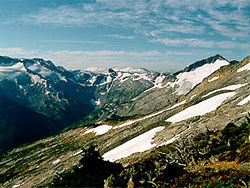 Alpine tundra transitions to sub-alpine forests below the tree-line; stunted forests occurring at the forest-tundra ecotone are known as Krummholz. Alpine tundra plants include grasses, hedges, herbs, and a few small shrubs. In between these plants are often lichens and mosses. 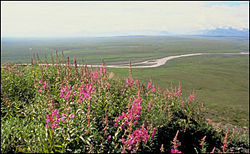 The tundra also has a variety of colorful wildflowers that bloom for a short time, usually just a few months in summer. Notable animals in the alpine tundra include Kea parrots, marmots, Mountain goats, sheep, elk, and pika. There are over 330 known species of plants in the alpine tundra alone, with 180 of them found in Rocky Mountain National Park, which has one-third of the park above treeline. Climate change threatens to reduce the percentage of tundra in Rocky Mountain National Park, as well as other areas, which will have an impact on both plant and animal life. All links retrieved June 28, 2007. British Antarctic Survey. 2004a. Terrestrial Plants. British Antarctic Survey. 2004b. Protocol on Environmental Protection to the Antarctic Treaty. Oechel, W. C., et al. 1993. Recent change of Arctic tundra ecosystems from a net carbon dioxide sink to a source. Nature 361: 520-523. Oregon State University. Climate change could doom Alaska's tundra. Science Daily (August 3, 2004). University of California Museum of Paleotology (UCMP). 2006. The Tundra Biome. Whitney, S. 2002. Tundra. Blue Planet Biomes. Yukon Conservation Society. 2004. Climate Change Impacts: A Changing World? This page was last modified on 4 April 2008, at 02:04.